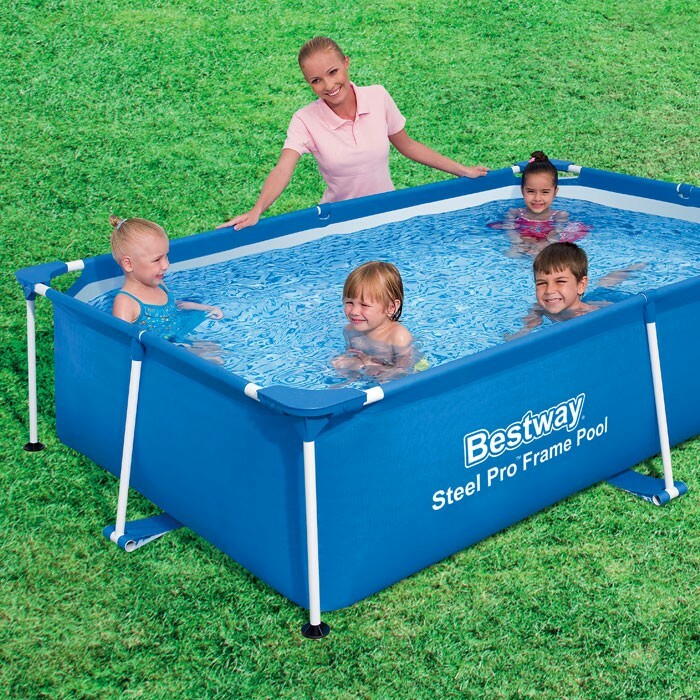 Size 87" x 59" x 17"
Size 4m x 2.11m x 81cm (157" x 83" x 32"
Misshapen pools Normally caused when the pools have not been set up on flat and level ground The pool will need to be disassembled and erected on a flat and level surface. This is not a manufacturing issue. Can the pools be set up anywhere? Why is the pool lopsided? How much water should I put in the pool? This depends on how often the pool is used, and if a filter pump and chemicals are being used. If the water is being maintained with the correct chemicals and filter system, then the water can last the summer season. This can be caused by excessive chemical use or over-exposure to direct sunlight. If this is the case, this will not be covered under warranty. The pool should be cleaned with a mild soap and water solution, such as washing up liquid or an alternative non-abrasive cleaner. It is recommended that the pool is stored in a cool dry place during the winter period as the cold weather can damage the PVC walls. Pools should be cleaned and thoroughly dried before being stored. 3. Screw the hose adapter onto the valve.